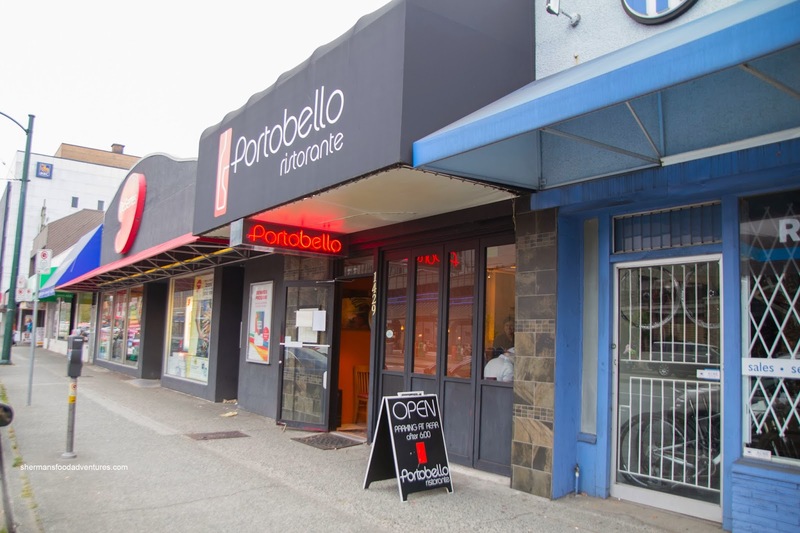 Ah yes, Portobello Ristorante. I remember when you were located on West 4th. 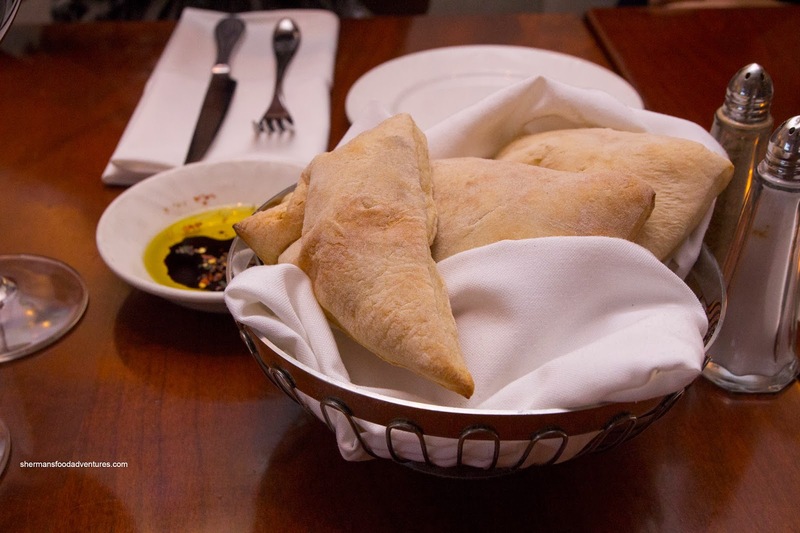 With your wood-burning oven, we were graced with wonderful fresh bread to start our meal. But one day, you were replaced by an Indian restaurant and ultimately another Italian-eatery called The BiBo. Incidentally, there was this other restaurant named Portobello out on Broadway near Memphis Blues. Was this you reincarnated? That question remained unanswered until Elaine selected it as the destination for her birthday dinner (it is the same!). We were started off with their popular freshly baked bread with olive oil and balsamic vinegar. There was nothing complex about the bread other than being warm, fresh and pillowy soft on the inside. Our first appie was the Calamari Pizzaiola with sauteed squid in tomato sauce, capers, olives, garlic and fresh herbs. Tender while retaining some chew, the squid sat in a mild, fresh tasting tomato sauce. There was a considerable salty kick from the capers and olives which was not necessarily counteracted by the sauce as it could've used more acidity. However, that would be nit-picking as the dish was quite good. 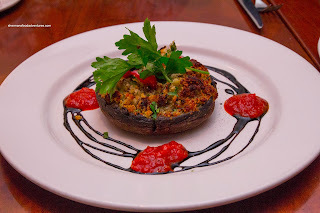 Plated nicely in the centre of the plate was the Fungo Portobello Gratinato stuffed with garlic croutons and fresh herbs accented by a roasted red pepper sauce and balsamic reduction. Being their signature appetizer, it succeeded in satisfying our expectations. 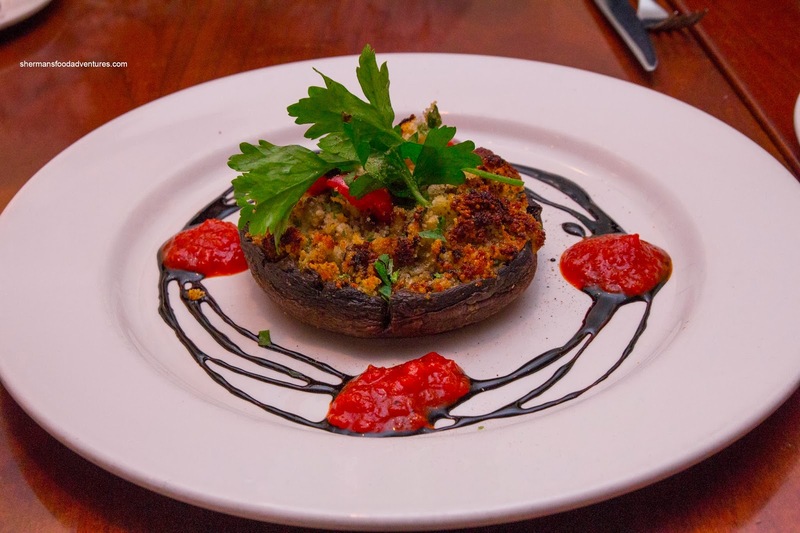 The properly cooked mushroom cap was soft while still firm enough to stand up to the crunchy surface of the stuffing. There was good flavours going on and in particular the balsamic as it added both sweetness and some acidity. 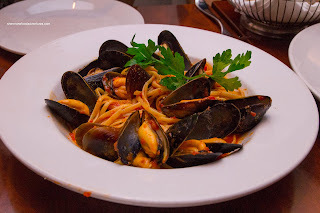 Onto some pastas, we had the Linguine con Cozze Fresche with fresh mussels and garlic in a spicy tomato sauce. 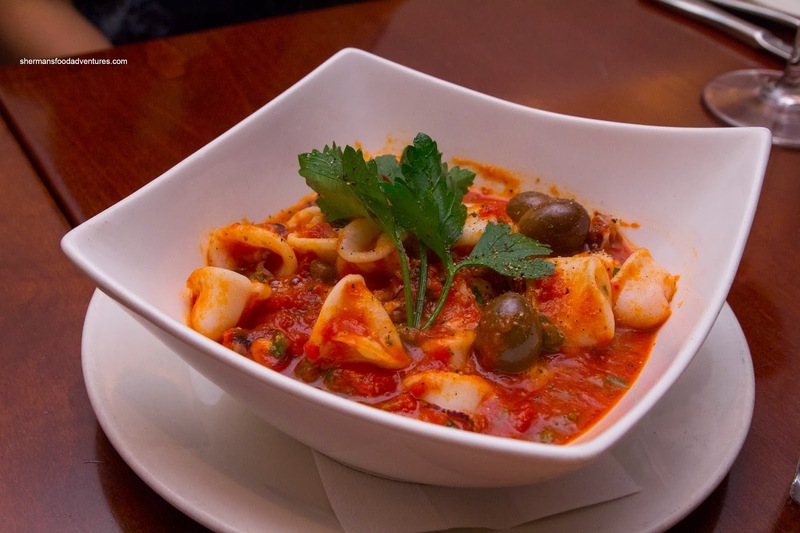 Even though it was supposed to be spicy, we found the tomato sauce similar to the one in the calamari appie being mild and fresh tasting. The linguine was a nice al dente while the mussels were large, plump and buttery soft. I liked this more than the Salmone Affumicato with wild smoked salmon, fettuccine, leeks and fresh dill in a cream sauce. For some reason or another, Viv and I felt the smoked salmon was super salty and overdone while Costanza thought otherwise. Was it a different piece? Anyways, the pasta was al dente while the sauce was indeed creamy and spiked with a nice amount of dill. 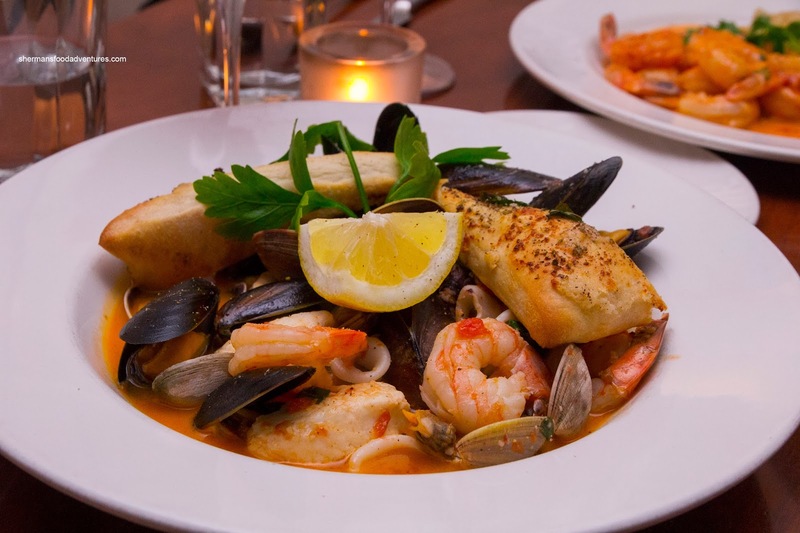 Onto our mains, we decided to share them all starting with the Cioppino di Mare consisting of halibut, mussels, calamari, clams and prawns in a white wine broth with garlic, tomato and fresh herbs. Despite featuring seafood, this was a hearty dish with a bounty of properly cooked ingredients. The light broth was sweet and seafoody tasting with a touch of tomato. 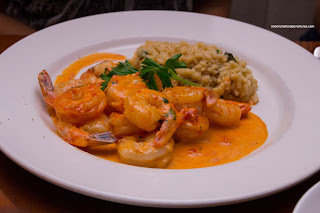 Continuing on with seafood, we had the Gamberi al Cognac featuring a dozen tiger prawns flambeed with cognac in a light rose sauce served with risotto. The prawns were nicely prepared exhibiting a buttery snap. 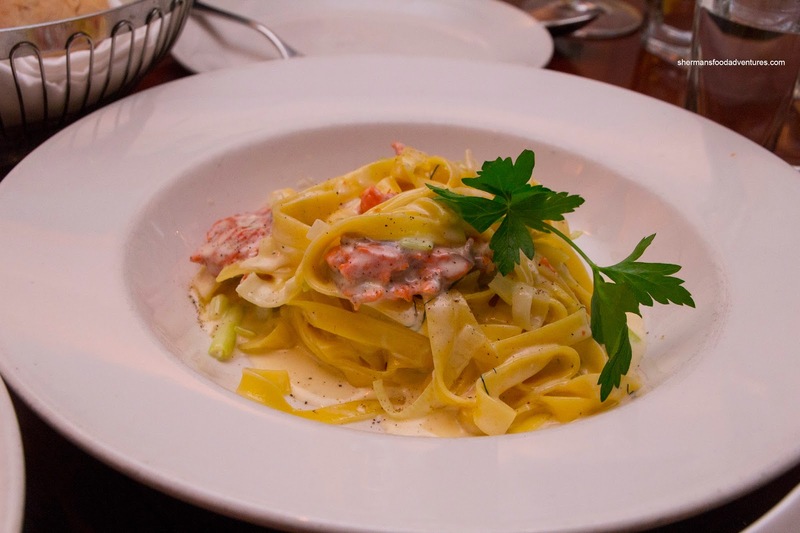 They were caressed with a creamy sauce with a hint of cognac. We found the risotto to be slightly overdone, but okay otherwise. 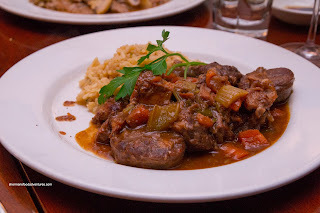 Onto some meat dishes, we tried the Ossobuco Classico which arrived as a very generous portion. Braised in red wine with rosemary, carrots and celery, I found the dish to be slightly salty. However, that didn't matter too much as the meat was fall-off-the-bone tender. Naturally, the bone marrow was fatty and delicious. 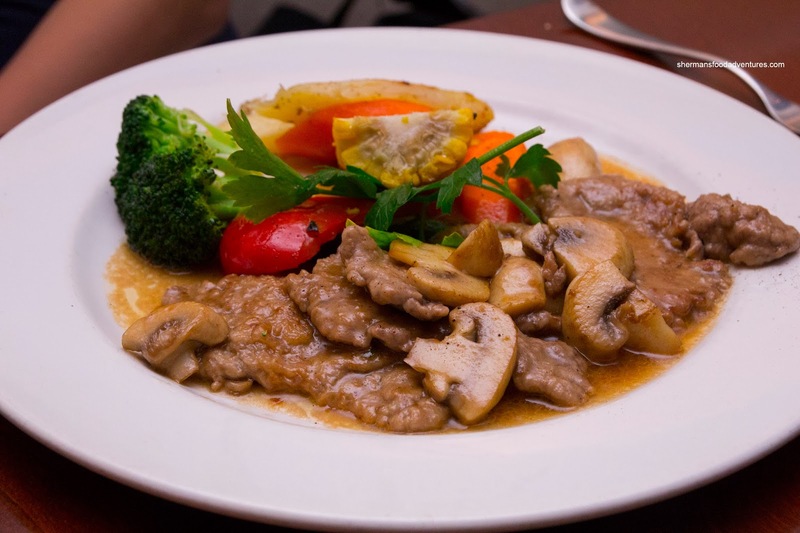 Lastly, the Vitello al Marsala con Funghi was also a good portion of thin veal slices sauteed with mushrooms and a butter Marsala wine sauce. Although the meat was a bit chewy, it was still easy enough to eat. I didn't particularly like the gummy texture of the flour coating on the veal though. The sauce was rich and Earthy. Lastly, we were too full to have our own desserts, so we shared a Tiramisu. We thought this version was very light and only semi-sweet. 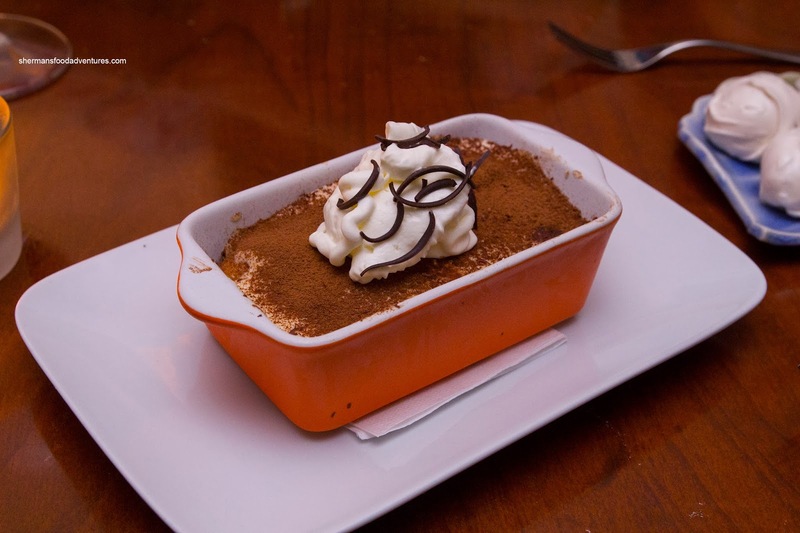 There was a mild espresso kick to go with the soft lady fingers and creamy marscapone. 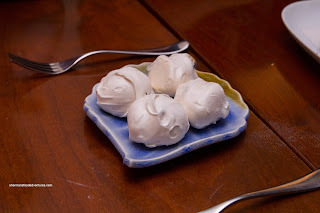 As a bonus, we were presented with some Meringues which were crunchy on the outside and sticky (with nuts) on the inside. Overall, we were pretty please with our meals. Portion sizes were fair and the food was above-average. We thought the service was more than acceptable as well.